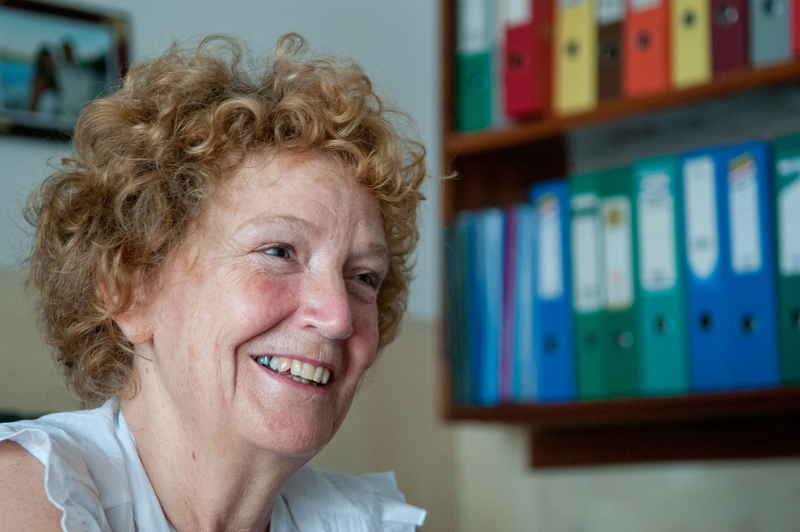 Lyn Lusi has spent her professional lifetime in medical care for the people of DR Congo. She and her husband, (Dr. K.M. “Jo” Lusi) began what is now known as HEAL Africa over 12 years ago in Goma. HEALAfrica provides comprehensive health care for the residents of the Kivu provinces in eastern DRC. A tireless worker and campaigner Lyn has worked with the local churches and communities to overcome stigma in HIV and latterly gender-based violence (GBV). A Christian herself she has constantly found herself pushing the boundaries of the local church, and often winning in getting them to overcome stigma and discrimination of HIV and GBV. HEAL Africa’s gender justice programme, which works with local tribal leaders has resulted in the change of attitudes towards women and as a result some changes in local tribal law, something nobody can remember ever happening. Lyn is tireless in her efforts to bring assistance from within the local community in Goma. The hospital not only provides pyscho-social care alongside the much needed fistula repair, but provides women with education and skills training so that when they do leave the hospital they can provide for themselves and their families. The impact of Lyn’s work has been far-reaching and has massively improved the lives of so many women. I applaud and pray for Lyn and Jo’s work and I pray for them and HEAL Africa every morning. I first learned of Dr. Lusi when two pilots (fellow missionaries of mine) flew desperately needed medical supplies to Dr. Lusi when the border was closed and most everyone had fled — as I recall, only Dr. Lusi remained. This was in 1996 or more likely 1997. God bless them! Lyn and Jo Lusi are 2 of the most inspirational people that I’ve met. We had the privillage of writing and photographing HEAL for an upcoming book about the hospital. How amazing is God that he creates wonderful people like Lyn and Jo who give their lives in serving others with such joy. I have had the priviledge of visiting HEAL Africa in Eastern Congo and was amazed at the scope of the projects and the depth of commitment of the staff. Lyn & Jo’s leadership is inspirational and effective in bringing about legal and cutlural change in a broken land. I’m proud to be a supporter. Does anyone out there have access to UK’s BBC Radio 4? Why won’t “Woman’s Hour” give Lyn an interview? This Lady’s work deserves wide coverage. I too have had the privilege of visiting HEAL Africa and stayed with the Lusi’s They are remarkable and their work nothing short of inspirational and miraculous. Like Pamela I am proud to be a supporter and encourage others to do likewise.